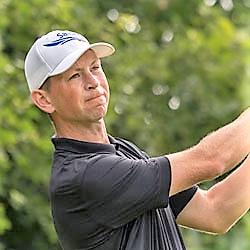 Peterhead's Ross Cameron shot a six-under-par 65 today (Sunday) to figure in a triple tie for the overnight first-round lead at the head of a huge field of 138 competitors at the Pro Golf Tour's Ocean Open at Agadair on Morocco's Atlantic coastline. Cameron, pictured, birdied the first, sixth, seventh, eighth, ninth, 11th and 17th in halves of 31-34. He had a solitary bogey at the 13th. He shares the pole position with England's James Wilson and Niklas Adank (Germany). Banchory's Chris Robb (Meldrum House) and another Scot, Liam Johnston from Dumfries are sharing fourth place with Johann Lopez Lazaro (France) on 67. Robb birdied the second, ninth,11th, 14th and 17th in 34 out, 33 back. Like Cameron, Robb had one bogey, at the 15th. The only other Scot to make the cut to the leading 40 and ties was Craig Howie (Peebles) with the limit mark of 71. Those eliminated Kevin Duncan (Cruden Bay) and Zander Culverwell (Dunbar) with 72s, Phil McLean (Peterhead) with a 73 and Glasgow's Chris Maclean with a 75. 65 R Cameron (Sco), J Wilson (Eng), N Adank (Ger). 67 C Robb (Sco), L Johnston (Sco), J Lopez Lazaro (Fra). 72 K Duncan, Z Culverwell.